Do you live in a Star Wars fan household? I’ll admit that I never even saw any of the Star Wars films until my first date with the boyfriend nearly 5 years ago, but ever since I have been hooked. Now, May the Fourth (be with you) is a special day for us to celebrate our love for Star Wars. One of my favorite most recent renditions of Star Wars is the Angry Birds Star Wars Edition app. There’s just something too fun about Darth Vader and Chewbacca Angry Birds, right? 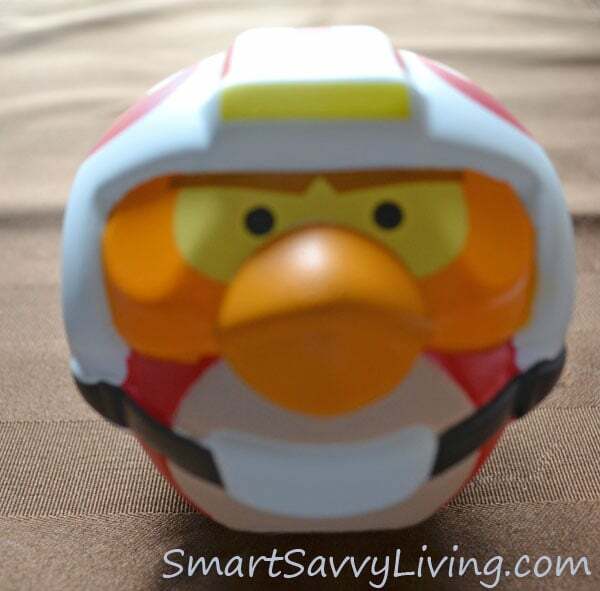 That’s why I was delighted to hear about the new Angry Bird games and toys just in the time for May 4th and was excited to open my review box from Hasbro! The idea of this game is rather cool, in my opinion, as it is a different type of game than most these days. No batteries, loud noises, flashing lights or sitting at a table for hours on end involved. Basically in the box you’ll find the Millennium Falcon pieces that you put together rather easily, including a cardboard stand, plastic pieces for the Falcon and stickers to decorate it with. 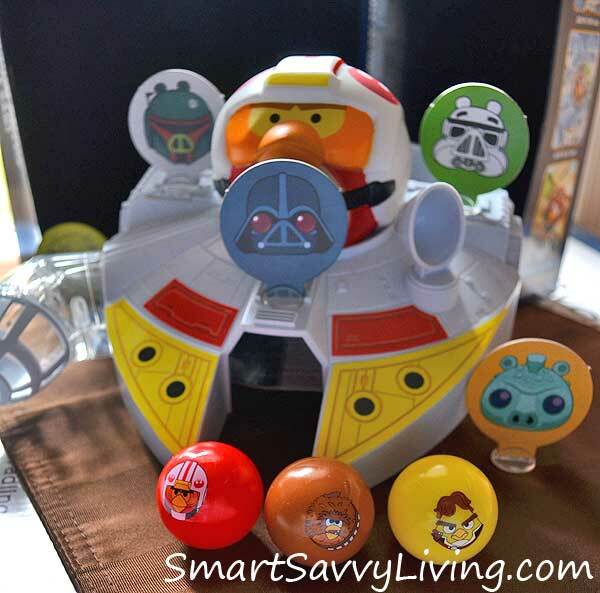 You’ll also find three balls (Luke, Chewie, and Han), 5 cardboard pigs with stands and a code to use in the Angry Birds Star Wars app. Everything is very easy to put together and takes just a few minutes. Once put together, the basis of the game is to bounce the balls and knock over the pigs or enter the Millennium Falcon. The box states the game is for those ages 8+, but as simple as it is, I think it’s best fit for ages 5-8. While I find that the game is nice in that it can be played with just one person, I think the most fun is in getting everything put together and don’t see most kids wanting to play with this very often daily as the excitement just won’t be there that long. The boyfriend thought that the game looked cool, but commented that it was basically a version of beer pong for kids, lol. ;) I think this game is more fun as a visual piece than to actually play with as while it is sturdy for repeated use, I just can’t see kids wanting to continually play with it, plus the pieces and balls will inevitably end up lost in corners and holes as they go flying. We both really loved this item and will likely be filling out the collection with the other characters! It also contains a code to use within the app. Win It: Congrats to our winner, Cassandra E.! Disclosure: I received the following items pictured above at no cost in exchange for an honest review of a fun game night from Hasbro. Hasbro is also sponsoring the giveaway prize and is responsible for all prizes and shipments. Smart Savvy Living cannot be held responsible for any unfulfilled prize shipments or damages. My older son loves luke sky walker. My favorite was Han Solo. Oh gosh he doesn’t have a favorite yet but he would love the game! My son loves Boba Fett! My son would totally love this!!! I will have to put this on his Christmas list for sure!! Thanks for the chance!